Once in a while everyone needs an escape, a sneaky getaway to unwind from the hectic everyday working life, and having some ‘you’ time to relax, unwind and do what you love. I have never surfed before, but an escape full of fitness challenges is a great way (for me) to unwind, release adrenaline, explore, meet new people and have a whale of a time. Being in the ocean can be one of the most peaceful or wildest places, being in the surf was almost like food for my soul, sounds completely cheesy, but I typically always relate everything I do to food, lets see if you can picture it, close your eyes, and imagine being in the water everyday having the sand between your toes and the sea salt entangled in your hair, things become simpler, you smile, you laugh, you whoop when your friends catch a wave, you become a child again! It’s no secret that surfing is fun, it makes you feel young, wild at heart and free! No doubt about it, the atmosphere at a surf camp is full of awesome vibes, mixing with a variety of people from all around the world, chatting about waves, trying to learn new languages, dancing away to your favourite songs, discovering your inner-self and the extent of your flexibility in yoga classes or just chilling out in the hammocks. Endorphins, adrenaline, serotonin we receive from surfing is an explosion of happy hormones, combined with dopamine from the unexpected reward of catching a wave makes surfers feel great and keeps them coming back for more. Whether you’re a total beginner, intermediate or looking to take on pro standard waves Dreamsea Surf has the ideal locations (France, Spain, Portugal & Nicaragua) and will take you to the best surf spots suited to your ability level. Being a complete novice I booked myself in the intensive package at the French site in Moilets, as it was Dreamsea Surfs 10th anniversary. The great atmosphere, welcoming and laidback staff, mouth-wateringly healthy food, and a variety of surf and fitness packages makes this base ideal for any traveller. Full board: breakfast, picnic style lunch, dinner. Breakfast - selection of breads, cold meats, cheese, salads. Alongside breakfast cereals, yoghurts, fruit and pastries. Saturday – Pasta night: Pesto Pasta, tomato and herb & creamy chicken pasta. Tuesday – Vegetarian night – Hummus, crisp bread, vegetable couscous, grilled peppers, salad (feta and orange), courgette soup and rustic bread. Friday – Paella night – vegetarian / chicken paella, grilled peppers and rustic bread. Intensive package: Includes 15 hours of surf lessons. All lesson in the water, with skill practice on the beach. 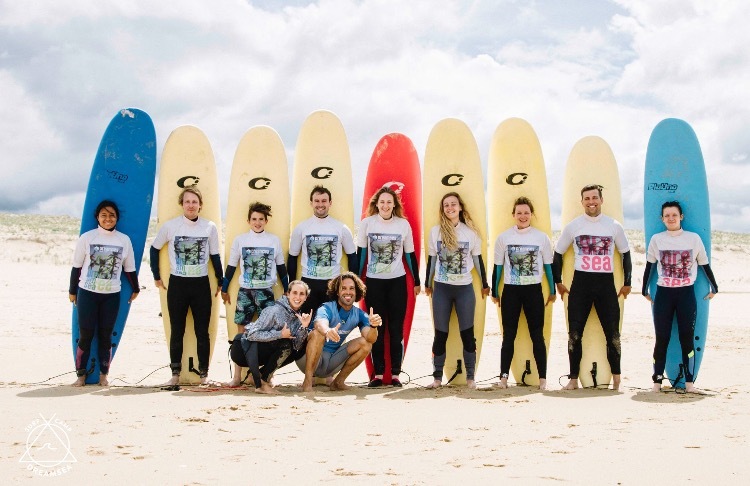 The first day in camp you are put into groups and introduced to your surfing instructor, who will look after you throughout the week and see you progress into a top surfer. One instructor per 8 humans, meaning the sessions can be tailored to your individual needs. ‘Relax and replenish your mind and body through yoga’. Focus on your inner self and escape from the monkey mind. While every surfer doesn’t practice yoga, it was a great compliment to the surf camp. Both sports require a degree of strength, flexibility and balance that are trained through regular practice, making them more of a lifestyle rather than a sport. Everything we do / say in life has a ripple effect. To make a change on the outside, we need to start deep within ourselves. Acknowledging our weaknesses and imperfections we can develop a more empathetic approach in our behaviour towards others. Intensive course included 3 hours of yoga lessons on the the yoga mat, honouring where are bodies are today (throughout the weak the intensity of surfing and exercise progressively takes its toll on your muscles and you start to ache and become stiff) and not pushing beyond our limits. The yoga technique of observing the breath can help surfers in the water in between waves and during challenging situations, staying focused and calm. Typically the level of comfort is the main difference between camping and glamping. However, at DreamSea the Camping tents are what envisaged as ‘glamping’. The canvas styled t-pee tents were raised off the sand on a wooden platform; the tents were high enough to stand up in with two mattresses raised off the floor by wooden crates, making your week stay suitably comfortable. Bedding and sheets were provided by the camp (for an additional small fee). The camping was situated in the heart of the camp, right by the bar, breakfast area, reception, ping pong table and skate ramps giving it a true camping atmosphere. The campsite itself adhered to a strict rule of ‘quiet time’ after 11pm to respect all other campers. The Glamping tents were located in the quietest zone of the camp, perfect if you want more privacy and isolation . Tailoring for all weathers, due to two day of red flag and no surfing. The camp got to create there very own long boards with the demonstration and teaching from Ayma himself. A great morning of creative work and a beautiful memento to take home. The Dreamsea experience is something i will never forget. Memories will last a lifetime. Disclosure: Please note the above review is based of my own opinions of a holiday i booked. Please note there are a huge variety of surf camp and holiday experiences available.